With a marinized circuit board, stainless-steel hardware and all the right waterproofing, the MA6004 is, like all JBL® marine audio products, built to survive salt water, corrosion and other risks – and show you a great time out on the water. The JBL® MA6004 has onboard 12dB electronic crossovers, giving you tuning options for systems of any size. Versatility, convenience and ease of use are all part of the JBL way of sound. Your boat may give you a choice of where to install your sound system, or it may not. Fortunately, the MA6004’s variable bass-boost circuit provides additional bass tuning to optimize performance, regardless of where it lives. Owning a boat takes commitment and work. Installing the JBL® MA6004? Not so much. It’s also pretty compact at 13-1/4" x 10-1/4" x 2-3/16" (337mm x 261mm x 56mm) with a low-profile heatsink. You can put it in some very tight spots. 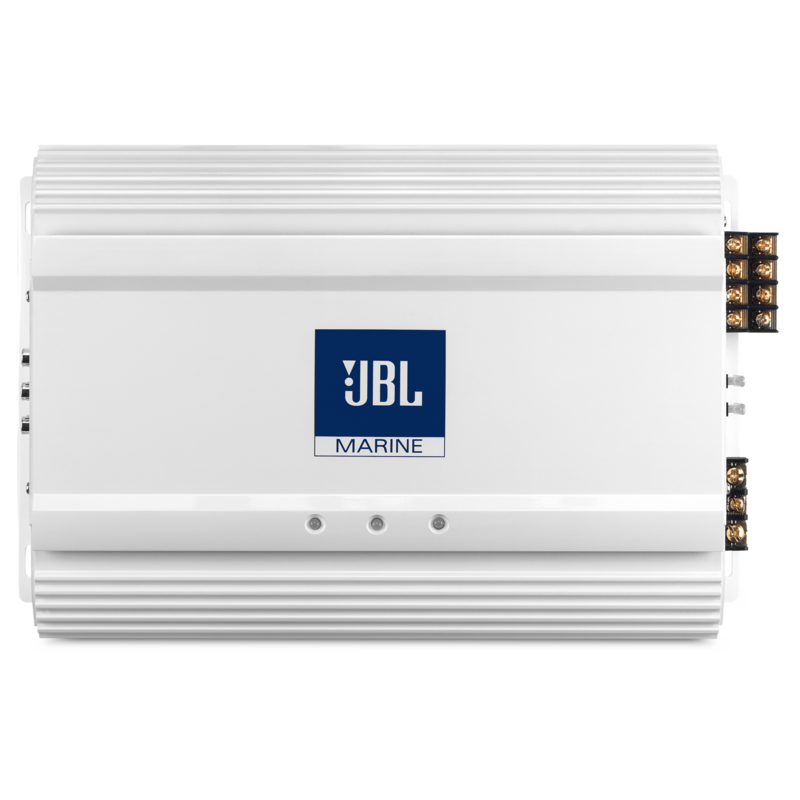 The JBL® MA6004 has output of 60 watts RMS X 4 channels at 4 ohms. You can fill the fresh, open air with great sound. The MA6004 comes equipped with a separate 12dB Per Octive Electronic Crossover for front and rear channels. 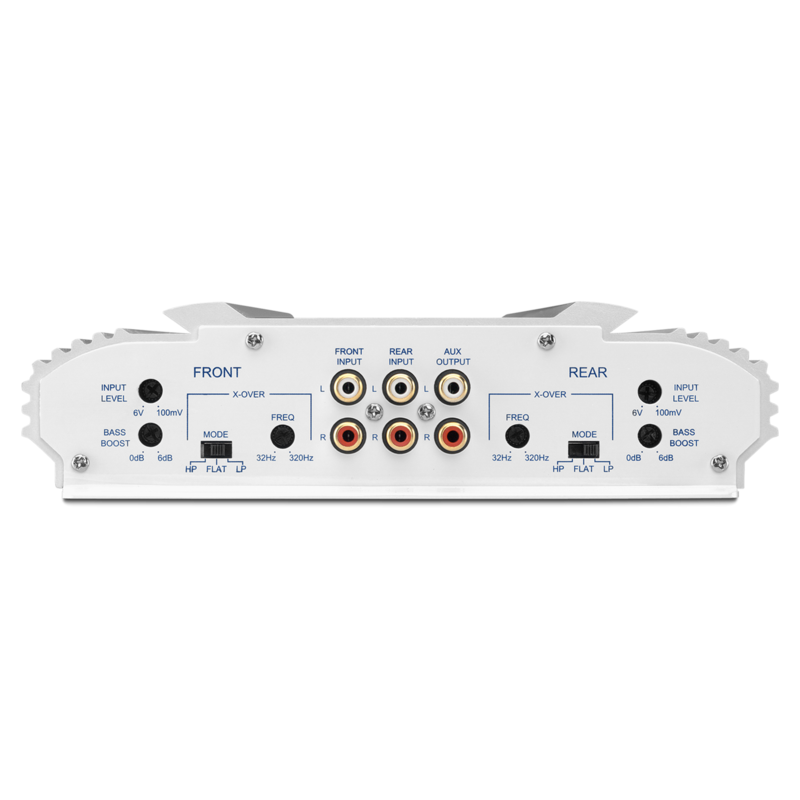 This provides a high level of tunablity and allows for different speakers to be connected to the front channels and rear channels. Both crossovers are setep to allow for either high-pass or low-pass. The front and rear channels are also equipped with a separatae variable bass boost for the front channels and rear channels. There is a total of 6dB of boost available centered at 45Hz. The MA6004 has a preamp output which allows a full range signal to be passed on to additional amplifiers. Upgrade the sound on your boat with JBL® power that can take on the open seas. The MA6004 has marinized circuit boards to keep salt air and corrosion away and survive the brutal conditions of heavy waves and harsh weather. You’ll have tuning options for systems of any size, variable bass boost and easy installation in tight spaces. You’d be hard pressed to find a better audio system for any voyage, whether it’s a leisurely afternoon on a placid lake or a race across the Atlantic. And your next party out there? It can sound great!